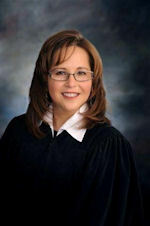 Judge Cheryl Rios was appointed to the district court bench in 2008. Previously she was Associate Judge for the City of Topeka, Municipal Court. After practicing critical care nursing for 6 years, Judge Rios graduated from Washburn University School of Law in 1993. The judge served as a staff attorney for Cherokee Nation of Oklahoma, served as an adjunct professor at Washburn University and is a former Shawnee County Assistant District Attorney. The judge has previously served on the YWCA Board of Directors, Topeka Collegiate School Board of Directors, MANA de Topeka’s Board of Directors, and the National Association of Women Judges Board of Directors. Judge Rios currently serves on the Kansas District Judges Association Board of Directors, Kansas Judicial Council (Criminal Law Advisory Board), Kansas Continuing Education Committee, and Topeka Community Foundation’s Board of Directors. Judge Rios previously served as chair for many years of the Shawnee County District Court’s IT Committee. Judge Rios is a member of the following organization: NAWJ, HNBA, KBA, TBA, KWAA, KWAAT, MANA de Topeka, Topeka Rotary, and Washburn University Alumni Association. Judge Rios has two adult daughters.